The theme for the luncheon cooking class this past Wednesday at Grace-Marie’s Kitchen Cooking School at Bristol Farms was Family Summer Reunion, which is sort of how I felt when I arrived. Many of the regulars who attend these classes know me from previous times when I was shooting during class or have visited my website. I hadn’t been to class for about a month, so when I walked in I got a big hello and happy greetings. And a big hug from Grace-Marie. I think they get a kick out of seeing me shooting every little move Grace-Marie makes while she is preparing her dishes. And I am the comic relief as I am lining up a shot of a platter of food, only to have it whisked out from under the camera so it can be served. It is a big challenge to shoot in the Bristol Farm’s cooking school, because there are four sources of light. The blinds on the south-facing windows are kept shut during class to keep from blinding everyone in the room. In the cooking area it is rather dim with florescent and incandescent bulbs mixed with the sunlight. And in the back prep room, there is solely florescent overhead lighting. I am constantly changing the ISO and white balance on my camera to get the food to look its correct color. After everyone leaves, I set up my tripod, open the blinds, do a little food styling and shoot in the natural light. This will help you to understand why the photos look the way they do. 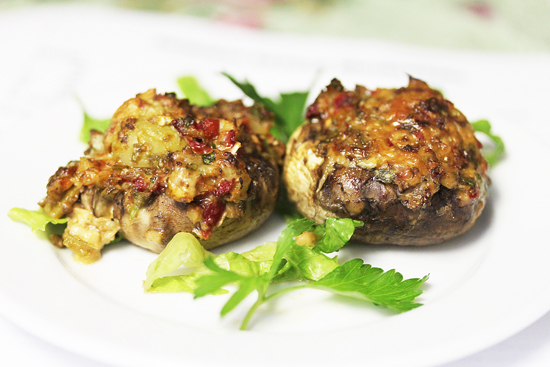 The Summer Savory Stuffed Mushrooms were the wonderful appetizer for a menu that also included Summer Garden Potato Salad, Family Reunion Chicken Skewers and Surprise White Chocolate Chip Cookies. I will be posting about the other recipes in the near future. 1. Combine and mix the peppers, olives cheese, onions, parsley, oil, salt and pepper. 2. Arrange the mushrooms onto the baking sheet with the open end upward. Spoon the filing into the center of each. Be sure the filling is packed down into the cavities of the mushrooms. Sprinkle with Parmesan cheese. 3. Bake until the mushrooms are tender, the filling is warm and the cheese is melted (20 minutes). 1. Either on individual plates or a platter, scatter the lettuce. Arrange the mushrooms on top of the lettuce and serve. Olives and gouda stuffed into mushrooms…this would make my husband so very happy! What a fun event that you got to be a part of…and your pictures look stunning, as always! I would have loved to have joined you! That’s a mushroom I would take home to meet my mother! I usually stuff mushrooms in cooler months, but this IS a perfect summer recipe! Oooh, I love stuffed mushrooms, and these savory ingredients sound more to my liking than the usual bread crumb and herb type stuffing. I’ll have to try these, but I will use creminis or portobellos. If you could only stuff a shitake! 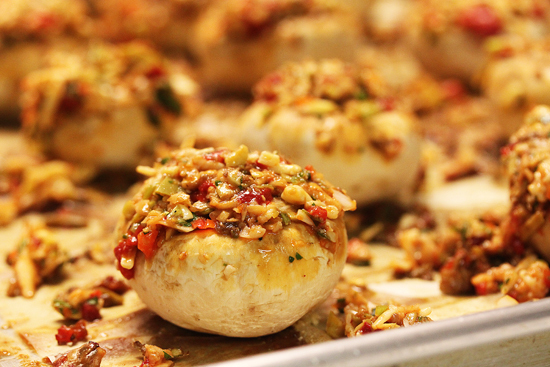 Mmm, those are some of the best looking stuffed mushrooms! Get in my belly! I attended this class and I can tell you that these mushrooms were amazing, as is everything prepared in Grace-Marie’s Kitchen. 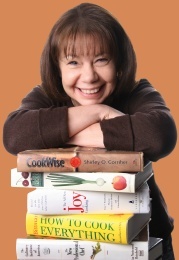 It’s fun to see how Lynne brings these wonderful recipes to life with her beautiful pictures and descriptions. Lynne – using Spanish green olives is the secret! I luv these small bites and these are on my list to try asap. There is nothing better then olives, period… olives make life better. I absolutely love love love that first photo… beautiful… I wish I took it… didn’t I take it? Polwig ~ For your info, TasteSpotting and FoodGawker both declined that photo that you like so much. Reason: lighting, color, white balance issues. I like it, too. Go figure. I would take these photos any day! Lovely mushrooms! This is a perfect pop-in-your-mouth treat. With all of those lighting challenges you still take an amazing photograph. Beautiful pics as always – did you submit the second pic to food pic sites? I like the picture of the roasted pepper on the stove – when I have a few chiles or just a few eggplants, I use the stove top method. FYI, I also reheat my tortillas on there too. I think that the classes given by Grace Marie are the BEST!!! the Westchester group loves coming!! !